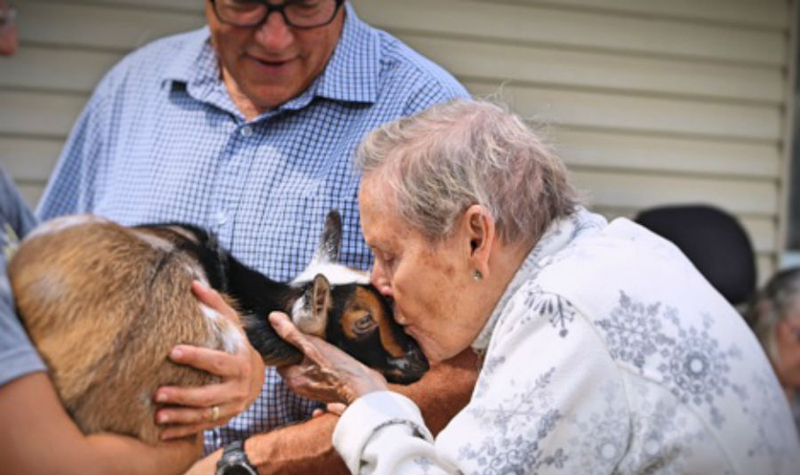 Resident Helen Knowlton is pictured here giving a kiss to a baby goat that was at Springfield Country Manor Aug. 24 along with several other animals from Woolley Wonderland Farm. SPRINGVILLE, Ont. – Springdale Country Manor residents recently had a memorable visit from some furry and feathery friends when animals from Woolley Wonderland Farm in Lakehurst stopped by the Peterborough-area long-term care home with their owners. Goats, lambs, sheep, potbellied pigs, newborn bunnies, ducks, geese and several breeds of chickens turned the courtyard into a petting zoo Aug. 24, and 49 of the home’s 68 residents came outside to meet them, some pausing to get in a hug with the animals, Springdale Country Manor life enrichment co-ordinator (LEC) Sonia Murney tells The OMNIway. “The residents really loved it,” Sonia says. Sonia says the visit from the hobby farm also attracted family members, and several staff members stopped by on their day off to meet with the animals and spend time with residents, she adds. Many people brought their children and grandchildren as well, which was an added bonus for residents, Sonia says. Springdale Country Manor is in a rural location, and some of the residents are from farming backgrounds, so team members organized the event with residents’ interests in mind, the LEC adds. “We truly wanted to bring the farm to the home, but we couldn’t, so we brought the animals to the home, which was the next best thing,” Sonia says.